#Inktober2018: How to stay focused during the year's biggest drawing challenge. Believe it or not it's October next week, and for illustrators that means it's time to pull out your pens for Inktober. If you're not familiar with Inktober, it's an annual challenge created by Jake Parker that calls on artists to create an ink-based drawing every day of the month and share their creations on Twitter and Instagram with the hashtag #inktober #inktober2018. Inktober might not sound too difficult on paper, but finding time to ink an image every day for 31 days can quickly become daunting. If you're like us, you'll soon find yourself asking how amazing artists like Lüleiya (who drew the breathtaking illustration above for day one of a previous year's challenge) keep up the pace. 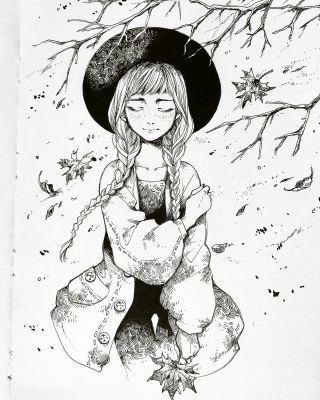 We're still admiring the amazing Inktober 2017 artists who made the whole challenge look effortless, but if you're struggling to get going with Inktober, or if you need a creative pick-me-up, as well as reading our tips on how to get started with ink drawing, we've put together some tips to help you on your way. Each day of the month is assigned a single word prompt to provide the starting point for an illustration. These include a range of ideas, such as swollen, gift, muddy. Of course you don't have to stick to these prompts, but they're there if you need them. You can also make your own list of prompts. If you're stuck, check out our article on 20 ways to overcome creative block for inspiration. If the official prompts aren't working for you, there's always the hashtag to explore for inspiration. Simply type #Inktober or #Inktober2018 into the Twitter or Instagram search box and you'll instantly get a glimpse into how other illustrators are tackling the challenge. Not only that, but you get to browse social media and not feel guilty that you're wasting time when you should be drawing. It's a win-win. Don't forget to comment on pieces you like with words of encouragement: the support goes a long way to helping other artists persevere. You never know when you might grab a spare five minutes, or whether or not you're going to get struck by inspiration, so carrying your ink pens and a notebook with you wherever you go is another way to make Inktober more manageable. Time for some straight up technical advice that should save you some headaches further down the road. In this video by Kiara Lashay over on her YouTube channel Kiara's Studio, she recommends working from left to right to avoid smudging when illustrating with ink. If you like the idea of using the Inktober prompts we mentioned earlier, another way to make the most of them is to pick a theme you can hang them around. We've seen lots of artists doing this over on the Inktober hashtag, and it looks like a genius way to narrow down your decision making over the coming weeks. Not only that, but by picking a theme you're comfortable with, you get to play to your strengths by illustrating something you care about. This could be anything from Disney princesses to robots – or, as Twitter user Joey Hernandez demonstrates, the TV series Lost. Bit of a controversial one, this. Given that life is busy and that it's hard to make the time for creative side projects, artists need all the help they can get to crank out an ink illustration every day for 31 days straight. To this end, Windy Iris suggests in the video above that doing some groundwork in the form of preparatory drawing is fair game. As long as you're just sketching ideas in pencil and not actually inking your work it's not breaking the rules... is it? We're sure that some Inktober purists out there will be marching on Creative Bloq towers with torches and pitchforks for suggesting such a thing, but give yourself a break. Inktober is a long challenge, so it makes sense to get ahead if you want to. We've bleated on and on about how Inktober is great for polishing your artistic skills and discipline, but remember it's also a fantastic opportunity to simply have fun. Be sure not to go too hard on yourself, and if you need to skip a few days it's not the end of the world. Nothing stalls a creative roll like unnecessary stress, and this pressure will definitely come across in your work. So keep your art looking good by relaxing. If you see illustrations you like on social media, make sure you share them with your followers. Hopefully you'll make some new friends along the way and discover exciting artists you've never heard of before.